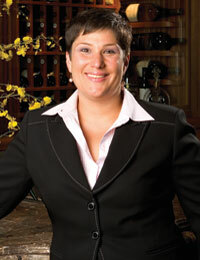 Among the superpowers of advanced sommelier Lisa Redwine is the ability to determine the grape varieties; country, district, and appellation of origin; and vintage of a wine in a blind taste test. As an instructor in SDSU’s Business of Wine program, she demonstrates this skill in her Exploring Wine course every semester. For over a decade, Redwine has been sharing her immense knowledge in one of SDSU’s most popular programs. Now a sales representative for Regal Wine Company, she is the former food and beverage director at The Marine Room and La Jolla Beach and Tennis Club. She says her career in wine happened entirely by accident when she had a “crazy idea” to open a restaurant. Upon the advice of successful restaurateur John Cunin, Redwine went from the kitchen to spending time in the front of the house. That’s where she fell in love with wine. That’s also where she noticed that sommeliers had more fun, and the rest is history. As far as her name exactly matching her profession, Redwine says, “I met my husband on a blind date. When I found out his last name was Redwine, I knew it was destiny.” She answered a few questions about her course and the industry. What classes do you teach in SDSU’s Business of Wine program? I teach Exploring Wine, which keeps me grounded in the foundation and is up-to-date because things are changing all the time. I also assisted in developing some of the Intensive classes, and I teach the Dessert Wines Intensive. We explore the world of sweet wines that are produced globally, and delve into different styles from both old and new world countries. I learn probably more than the students because of the questions they ask me. It really forces you to go back and re-educate yourself and that’s what I really love about teaching. What’s the most interesting thing about the wine industry? I think the most interesting thing is that it’s an industry you can never master. It changes all the time. You can never know everything about everything. What will your students know after completing your course? Students will learn so much. Take walking into a wine shop for example. There will be a distinct comfort walking into a wine shop. They will understand a label’s language and how to read a wine label. So when they see “Chablis” they understand that’s Chardonnay. When they see a German wine label and they see the word “truken,” they will know that means dry. They will learn wine label terminology and a distinct understanding between acidity and tannin in wine, and how to distinguish those two on your palate. Other things are: the basics of wine tasting; a general understanding about the wine regions of the world; how to determine if the wine is corked; basic flaws in wine; how to decant wine and why to decant; and basic food and wine pairing. In my Exploring Wine class, people are shocked by the amount of material they have to read. It’s not a class to drink wine for three hours. I study wine at least 45 minutes to an hour every single day. People who study wine should first and foremost have a passion for it. There’s a difference between a passion for drinking wine and a passion for studying wine, because they’re very different. What do you think is the future of the wine industry? I think with the world economy, wine has become much more attainable. The other thing is that consumers are much more educated than they used to be. The role of sommelier is to take somebody who is educated and guide them to maybe a specific region they might like; or educate the consumer on the wines of all the new regions that are emerging. One of my favorite assignments is in the first class; I give them a list of varietal descriptions and they have to decide what varietal best describes them as a person. During the week they go out and try that varietal. Another assignment is that they become a winemaker and release a wine. I determine what part of the world and they have to create a label that follows the labeling guidelines as an importer into the United States. That gets them into a wine shop and gets them asking questions. Teaching at SDSU is a selfish endeavor. It’s completely selfish on my part because I get such a thrill out of seeing people literally fall in love with wine; you can see that connection happen. It’s intensely rewarding. What I find really amazing is what people have done after taking classes. I think of this young student named Juan. He didn’t know the difference between Chardonnay and Cabernet when he started the class, and he now he owns an import company. I had two students that met, fell in love, and got married. I had another student, Traci, who went on to open Splash Wine Bar. You can see the transformation happen in class. I had two women that were making wine, a little north or south of Temecula, and they brought it to share with the class. I recently got a phone call from a former student by the name of Fred. He was in his 60s and went on to open a consulting business after taking classes and getting his certificate. My assistant went through the class and now wants to take her quarter master sommeliers introductory. The knowledge you get from the classes is serious enough to get you very far. I have so much respect for the validity of SDSU’s program and what you can do with what you learn.